Off D300 Villeton to Damazan road. See map location. 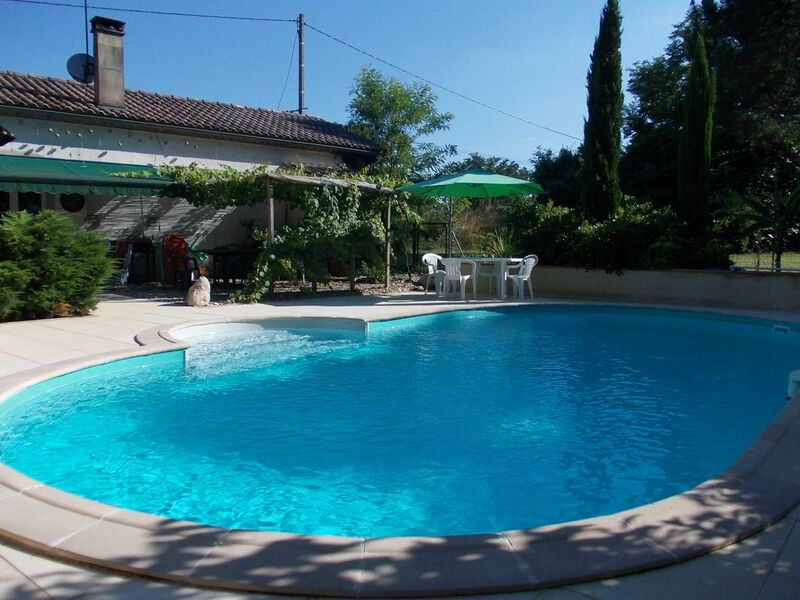 Restored and modernised cottage with private pool and garden. Peaceful but not isolated. Only 4 miles to banks and supermarkets. Half a mile to nearest restaurant. Near canal lateral, great for walking and cycling, 5 bicycles are available. The house is cool in hot weather. and there is sheltered parking. Three bedrooms. Two with en-suite. One triple room with 1 single bed, 1 King Size bed with the option of another single. En-suite bathroom. One.double bed room with en-suite. My home for the rest of the year. Peaceful and secluded, Pool totally private and just a few steps from the back door. All guests love the tranquility and privicy. Only one step to main bedroom, house\ pool all on same level. En suite bedroom 1, shower, basin, wc. En suite bedroom 2, bath with shower over, wc, basin. Washing machine. Bedroom 3, single with separate toilet. Hair dryer, ironing board and iron. Cooker, fridge/freezer, dishwasher, microwave, toaster, kettle and all kitchen and dining equiptment. Water skiing 4 miles at Damazan lake with Teleski Nautique. Very reasonable at 16euro per hour. 2 golf courses approx. 15 mile away, both 18 holes, green fees are very reasonable. Outside: Large private garden at rear with private pool approx. 5m X 10m, sun loungers, easy chairs and table. Flowers and shrubs around the pool which is fenced off from the main garden where there is plenty of room for children to play and ideal to keep a dog enclosed. Shaded area with large dining table and chairs with vine over. Gas BBQ. Cleaning / Towels / Linen / Maid service: Bath towels and bed linen supplied. Pool/beach towels not supplied. Other: Large sun lounge, seats 6 or more with front entrance door. We spent a happy 2 weeks enjoying a very comfortable property. David was extremely helpful and there if needed. The property was well equipped. We just chilled out which is precisely what we wanted. The pool was magic too. Many thanks. A perfect getaway place with everything you could possibly need, including a fabulous pool. The property was fantastic. It has everything you could need and much thought has clearly gone in to making sure your holiday fully catered for. There are plenty of things to do if you wish or it is a perfect place just to relax. David is on hand when needed and is so friendly. Nothing is too much trouble. We had a fantastic holiday again. We just love it here. Many thanks Claire you were wonderful guests, you left the house so clean and tudy I imagined you were not there. Thanks. Just home after 2 fantastic weeks at David’s Home. All the family had a great time, beautiful private pool and garden to relax. A gite with a lot of character and it had everything we needed to hand. David was a very attentive host and made us feel very welcome in his home. I would definitely recommend to anyone looking for a peaceful setting in a beautiful part of France. Many thanks Connor and your amazing family, you and your wife are an inspiration to life and I hope you will return soon. You will be very welcome. David made sure to stay in contact with us every day. The place was clean and fully stocked. We did not need anything. I highly recommend staying there. Many thanks Marie-Elsie, I enjoy meeting you, my first American guests. We really loved the peaceful location, and easy access to great cycling along the canal. We liked the peace and tranquility - and the pool was always clean and welcome on the hot days when we returned. Great spot with easy access from motor way via Damerzan. Thanks Adrian it was great to have you and your wife stay. Great guests. In Casteljaloux, 11 mls, there is great lake with sandy beach, bar and pedalos for hire also tree walking complex. 18 hole golf course. A Spa complex with Jacuzzi, sauna 2 heated indoor pools and massage facilities, approx. 18 euro for 2hours. Fun park in Agen., Walibi Sud-Ouest. In Buzet boats for hire on canal. Wine tasting and sales at Buzet cave. Rembrandt painting of Christ on the cross in, church in Le Mas d'Agenais. 5ml. Canal Lateral ideal for walking and cycling towards Bordeaux or Toulouse if you wish. 4 adult and 1 childs bicycles are available for use at your own risk. no helmets supplied. Atlantic beaches 2 hours drive away, Arcachon, Biscarrosse, Minizan, Dune du Pilat, highest dune is Europe, fabulous views of Basin de Arcachon and Cap Ferret. Bergerac and Bordeaux airports 65 mins away. Toulouse is 90mins. Tonneins rail station 10mins. access to Bordeaux Paris Agen Toulouse. Travel from Channel ports is around 8/10 hrs. Tonneins 5 mls. Damazan 4 mls. Castlejaloux 11 mls. Vianne 12 mls. Nerac 20 mls. Agen 25 mls. Canal Lateral 1/2 ml. All supermarkets and banks in Tonneins. Nearest restaurants, 2 at approx. half and 1 mile. Canal, great for walking and cycling. Plenty of evening activities in Local villages in July and August. Evening markets to enjoy simple local food and music. Damazan night market is every Tuesday July/August. Buy local food cooked by seller and local wines. Bring your own cutlery and glasses and join the locals at the large tables in village centre. BOOKING NOTES Secure booking on line with Owners Direct booking form. Non refundable deposit of 25% when booking is confirmed. Balance payable 2 months before arrival, this non refundable Changeover Day: Arrival day Saturday from 4pm, departure 9am.